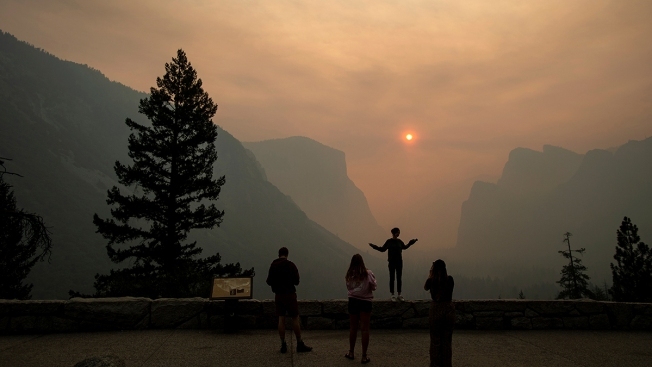 In this July 25, 2018 file photo, Hannah Whyatt poses for a friend's photo as smoke from the Ferguson fire fills Yosemite Valley in Yosemite National Park, Calif. Yosemite National Park could reopen its scenic valley and other areas Monday, Aug. 6, 2018, if conditions improve after a 12-day closure due to nearby wildfires. The park’s iconic cliffs have been shrouded in so much smoke that the air quality in Yosemite is currently worse than Beijing. Though the blaze didn’t reach the heart of the park, it burned in remote areas, making roads inaccessible and polluting the area with smoke. "We'd like to express our sincere gratitude to the firefighters and, Incident command teams for their great efforts in suppressing the Ferguson Fire. We'd also like to express our gratitude and thanks to our gateway communites who tirelessly helped visitors to the area while they were being impacted by the fire", said Michael Reynolds, Yosemite National Park superintendent. "This is truly a historic and unprecedented event in park history, and we are thrilled to welcome back visitors to Yosemite Valley and the Mariposa Grove." Officials say a much more destructive blaze burning farther north near the city of Redding is now 51 percent contained. Visitors can access Yosemite Valley from the El Portal Road (Highway 140), the Big Oak Flat Road (Highway 120) or the Tioga Road (Highway 120). The Mariposa Grove of Giant Sequoias will reopen to the public on Monday, August 13 at 9:00 a.m. The Wawona Road (Highway 41) will remain closed from Wawona to Yosemite Valley for at least another week due to ongoing fire activity and firefighter operations. Park visitors are being asked to drive with extreme caution and delays are possible due to fire activity and ongoing fire operations. Visitors should expect limited hours until the park returns to normal operations. Park visitors should be aware that there is still active fire and smoke on the roads and people should drive with extreme caution. Delays on the roads are possible due to fire activity and ongoing firefighter operations. There will be limited hours and limited visitor services at park facilities as the park returns to normal operations. The Glacier Point Road remains closed and is expected to open when the Wawona Road (Highway 41) reopens. The Hetch Hetchy Area remains closed due to smoke impacts but is expected to reopen soon.